Want a fun gift idea for Christmas? These Reindeer Rice Krispie Treats are absolutely adorable and so easy, your kids can make them! 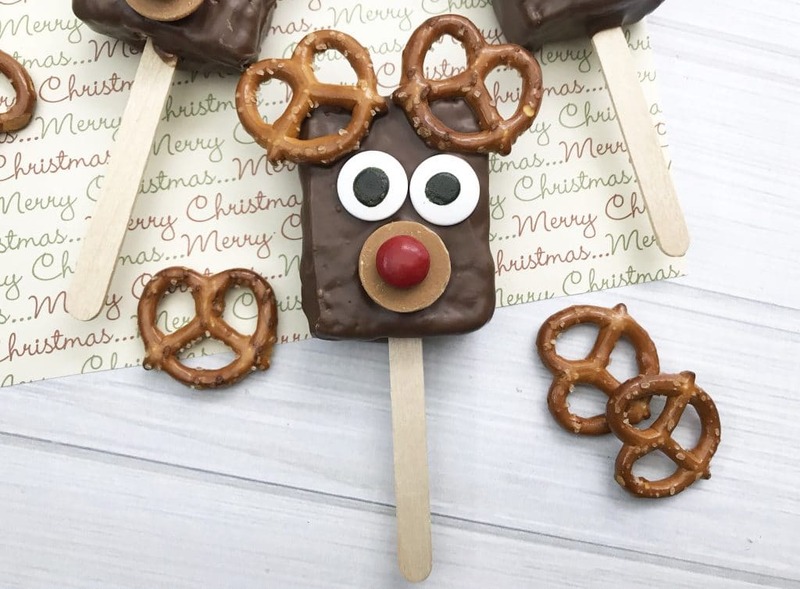 Get your kids in the kitchen and let them help you bring these reindeer to life. These make great gifts for your child’s teachers, neighbors, co-workers, family, and friends. Check out the Reindeer Rice Krispie Treat instructions and recipe below! Also, be sure to bookmark these Turkey Rice Krispie Treats for next fall. Begin by gathering your materials. 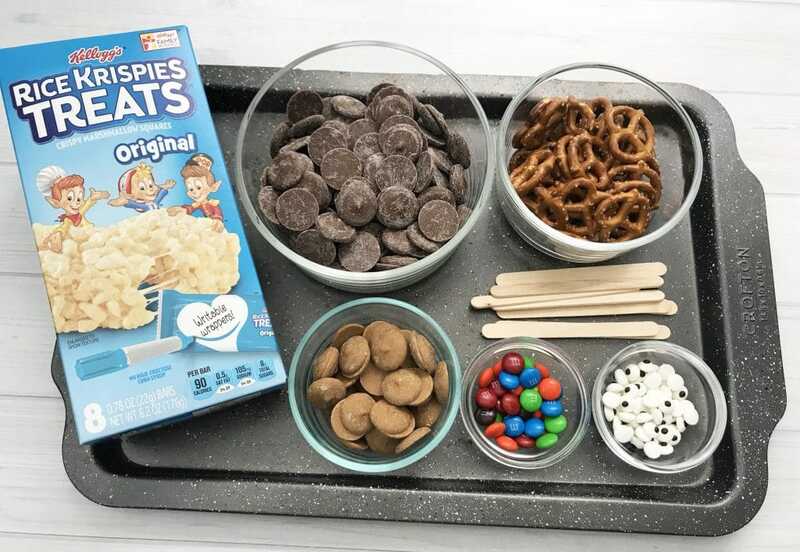 For this project, you will need Rice Krispie Treats, Wilton chocolate candy melts, Wilton peanut butter candy melts, red M&M candies, large candy eyes, popsicle sticks, and small pretzel twists. First, line a baking sheet with parchment paper. Go ahead and open the Rice Krispie Treats to get them ready for dipping. Insert a popsicle stick into the base of each Rice Krispie Treat. Next, place the treats on a plate or sheet pan and set in the fridge for 15 minutes. This will help the popsicle stick to get nice and stuck. Now it is time for the chocolate. 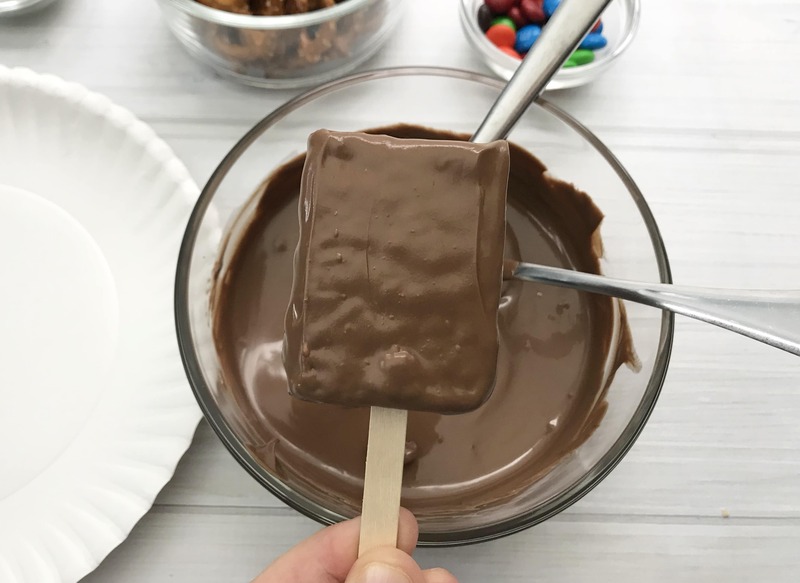 Pour the Wilton chocolate candy melts into a microwave safe dish. Heat in the microwave in 30 second increments stirring occasionally until melted. Remove the melted chocolate from the microwave and dip each Rice Krispie treat. Use a spoon to carefully coat each treat and allow the access chocolate to drip back into the bowl. Place the Reindeer Rice Krispie Treat on the lined baking sheet (if it is not lined, it will stick to the pan). Finally, the fun part of decorating the Reindeer Rice Krispie Treats! 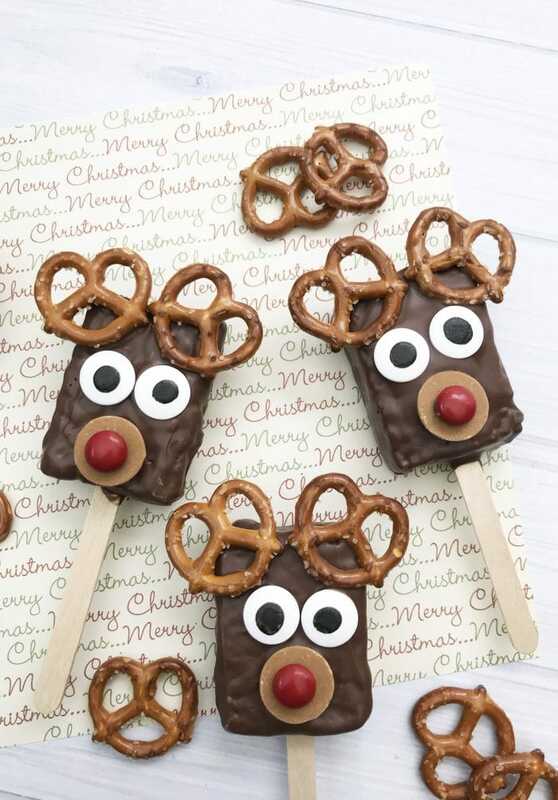 Give the reindeer 2 large candy eyes and 2 antlers using the small pretzel twists. Next, add a snout using 1 peanut butter candy melt. 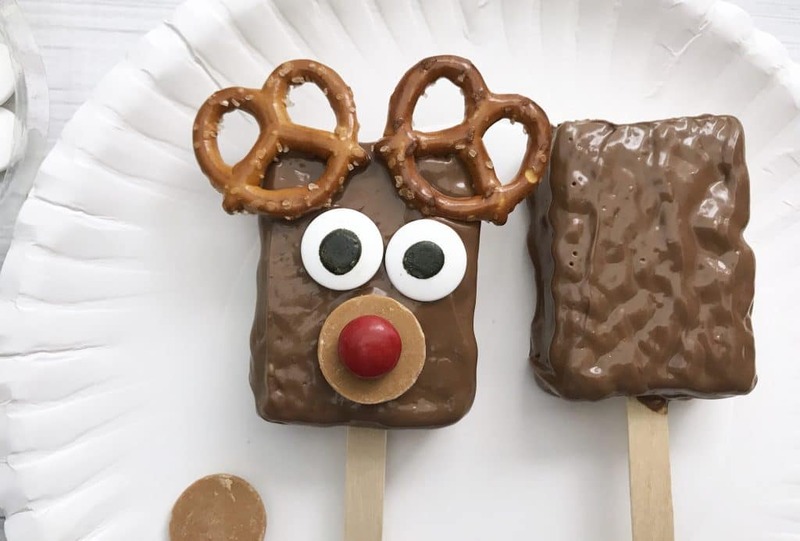 Put a small amount of chocolate on the back of the red M&M candy to help it stick, and then place on top of the peanut butter candy melt for the reindeer’s nose. It’s as simple as that! Now repeat with all 8 Rice Krispie Treats. Be sure to decorate each Reindeer Rice Krispie Treat completely before moving onto the next. If the chocolate is already dry, the decorations will not stick to it. If it does dry too fast, you can just add a dab of chocolate to the candy or pretzel to act as a glue. Be sure to print the recipe below and share the link with your friends! Pour the Wilton chocolate candy melts into a microwave safe dish until chocolate has melted. Dip each Rice Krispie treat in the melted chocolate. Place the chocolate covered treat on the lined baking sheet. 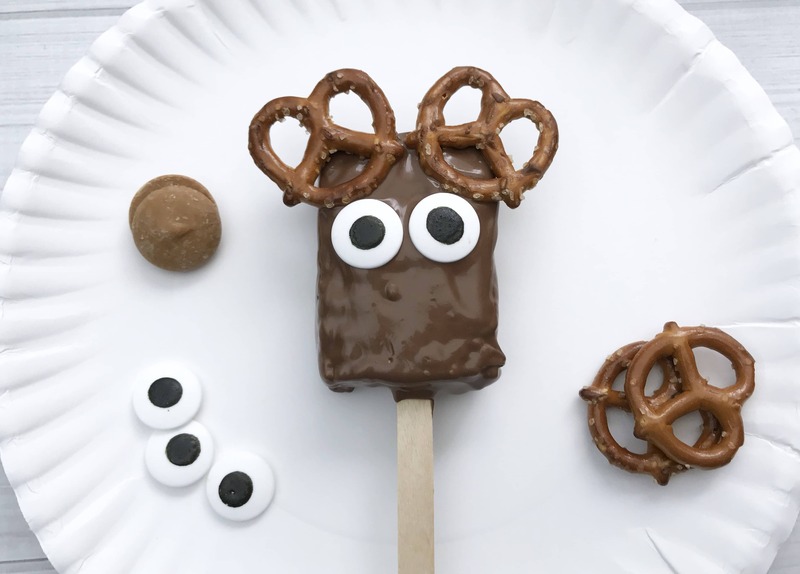 Give the reindeer 2 large candy eyes, 2 antlers using the small pretzel twists and a nose using 1 peanut butter candy melt. Put a small amount of chocolate on the back of the red M&M candy and then on top of the peanut butter candy melt for the reindeer's nose.